What started out with friends getting together for a Christmas baking exchange has now grown into a full family sponsorship. The Dutcher’s, Gowan, Silva, Trainer, Kitchen, Graham, Stark, Fess and Rulli families all got together and have sponsored a less fortunate family this Christmas. They supplied a full Christmas dinner and then some, dessert, gifts for all the family, christmas stockings for each family member and even gifts for mom. Everything came in totes that can be used for the family storage, which was needed. 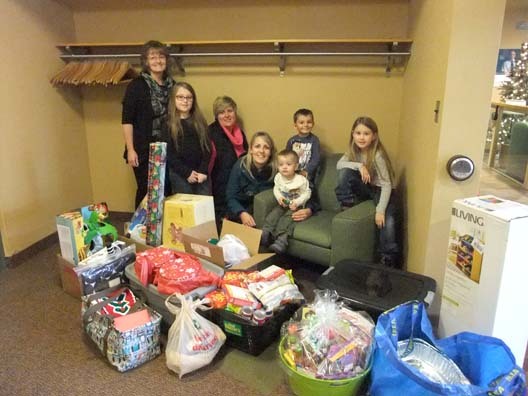 Shown in the photo is Krystal, Colby and Nolan Dutcher, Missy, Jorja and Alexa Silva, and accepting the donation on behalf of the worker is Heather McDermid, Supervisor. Thank you for making someone’s Christmas special. You are all Angels.